Greetings and Happy New Year! I had some good things happen in 2014 but more bad things in 2014. The new year is a time for a fresh perspective and outlook and praying that things look up every day. I never have New Years Resolutions but I do have one this year! To have a healthy and happy baby. Can't ask for much more than that right? Well friends, I did get some Barbie goodies this year for Christmas. These will be in a few posts so we'll get some awesome new cheer after the new year! And maybe you have a feeling at which doll will be featured first. I do have a confession to make. This doll hits stores around (and sometimes way before!) Halloween. I saw her and honestly, I wasn't too impressed. With all the sales of Monster High and Ever After High, Barbie has kind of taken a swan dive. I was discouraged by her cheap looking jewelry and I didn't think she was that pretty. I even went back a month later and looked at her again and thought the same thing. Then I opened her up on Christmas. I don't know if my eyes need checked or what but she looked prettier this time around. To me, she just had the sweet Barbie face that I just love and honestly, not disappointed in her at all. AND...she has a photo friendly box. 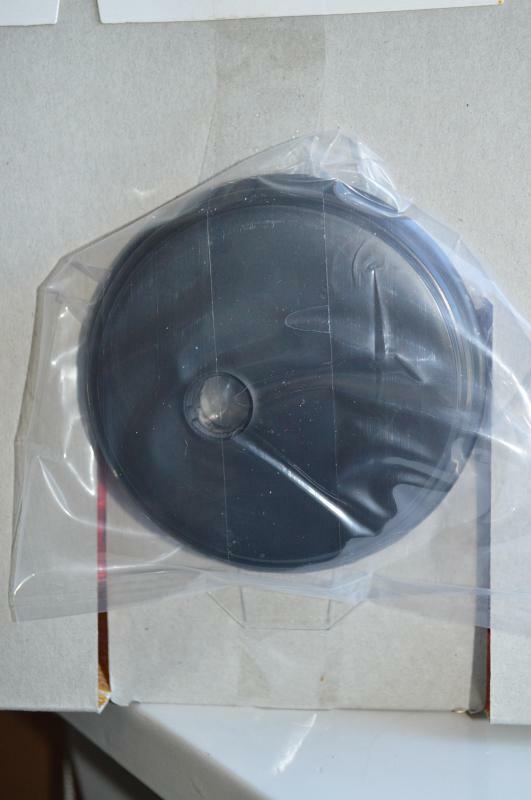 So I get boxed but deboxed pictures! I do like her dress though. We haven't had a ton of holiday dolls with lace. But I think the red and gold really do the trick. I love the little gold bow at the waist. I do love dolls with ruby red nail polish though! Just like the original dolls from the 60's. She does come with the standard doll stand but with a redesign. But really Mattel? Could you have not made the stand a little more fancy? At least with the dolls name on it or something? 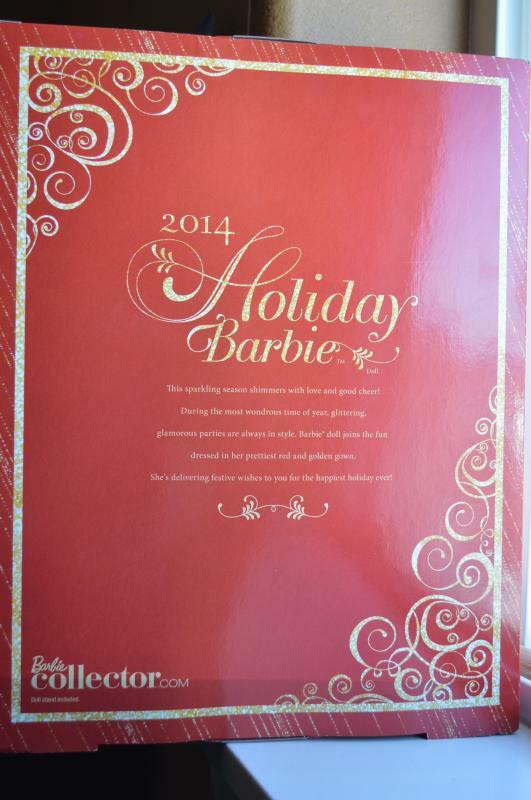 The Holiday Barbie line is one of the biggest selling lines of all time. Excerpt from the back of the box. "This sparkling season shimmers with love and good cheer! During the wondrous time of year, glittering, glamorous parties are always in style. 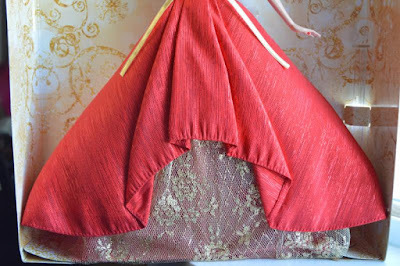 Barbie doll joins the fun dressed in her prettiest red and golden gown. She's delivering festive wishes to you for the happiest holiday ever!" And while I was searching for this doll on google, I found this picture. 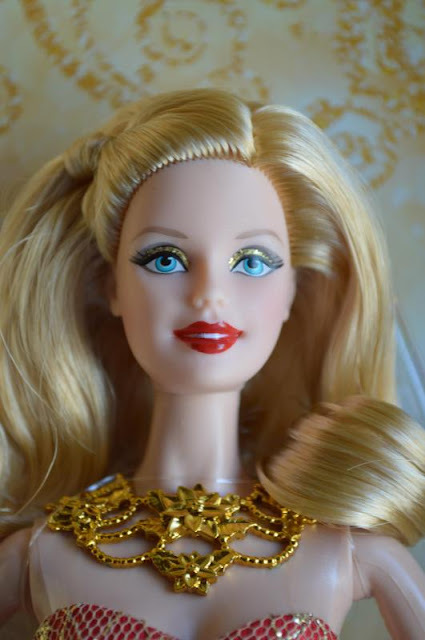 So everyone, was Holiday Barbie under your tree this year? What do you think of her? Let me know in the comments! Much more Christmas goodies to come in the following weeks. Stay tuned! The African American version is on my list. She is on clearance at Meyer for 12 dollars, and I'm not sure I can resist. Soooo pretty. A healthy baby is a perfect wish. I keep my fingers crossed it becomes true. Like you, I wasn't too impressed by her this time. She looked a lot like 2012's Holiday Barbie, but of course she was under our tree as well, courtesy of the hubster. Now I'm quite happy with her, except for that chunky necklace. Saturday Sequins - At $12, that is a very tempting price, especially for the AA doll. I'm not sure I could resist either! Andrea - I had a feeling she would be under your tree too :) Yeah, there is just something about the necklace. I think something with a tear drop jewel would have been much better suited. Her dress definitely grew on me though. 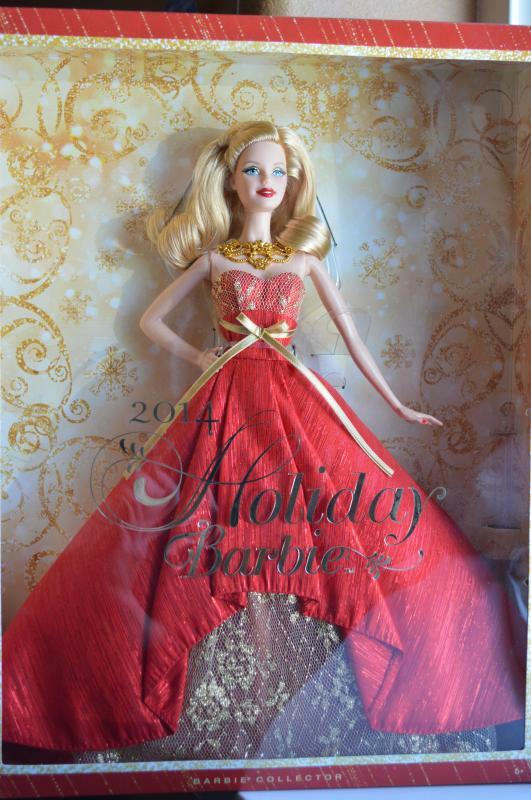 Barbie Lea - I can see how high-end collectors would be disappointed but the gold lace and red taffeta really works. I'm not unhappy with it. 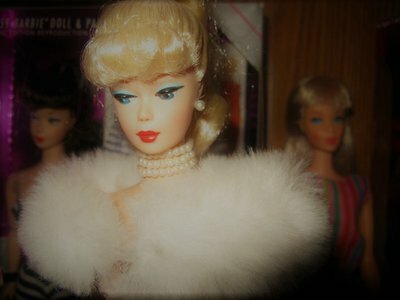 :) I agree that the AA is the prettiest but as I said above, there was only the blonde dolls in the stores in my area! I've seen her online and she's gorgeous. Did you end up picking her up?